An international team including members of the Art Institute of Chicago, the Palazzo Altemps Museum in Rome and the University of Chicago used new technologies to make an improbable discovery about two portraits of Antinous. 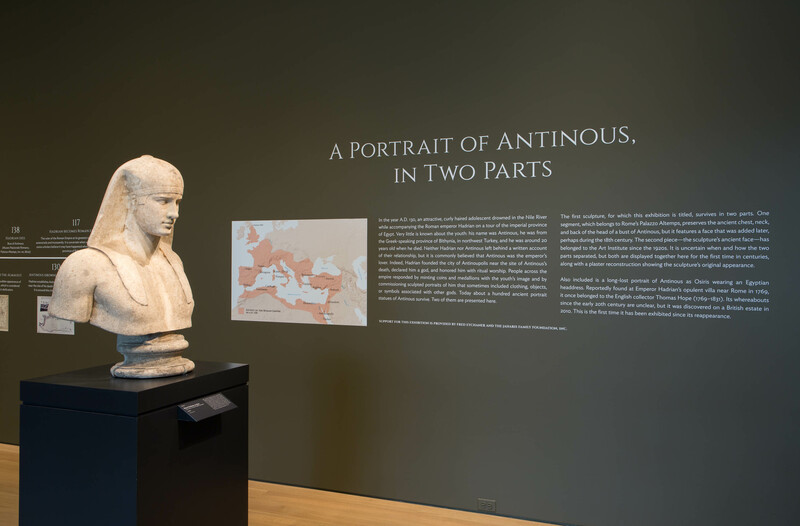 The years of research that led to this discovery were the focus of an exhibition titled “A Portrait of Antinous, in Two Parts” at the Art Institute of Chicago (opened on April 2, 2016) and another one titled “Antinoo. Un ritratto in due parti” at the Palazzo Altemps in Rome (opened on September 15, 2016). 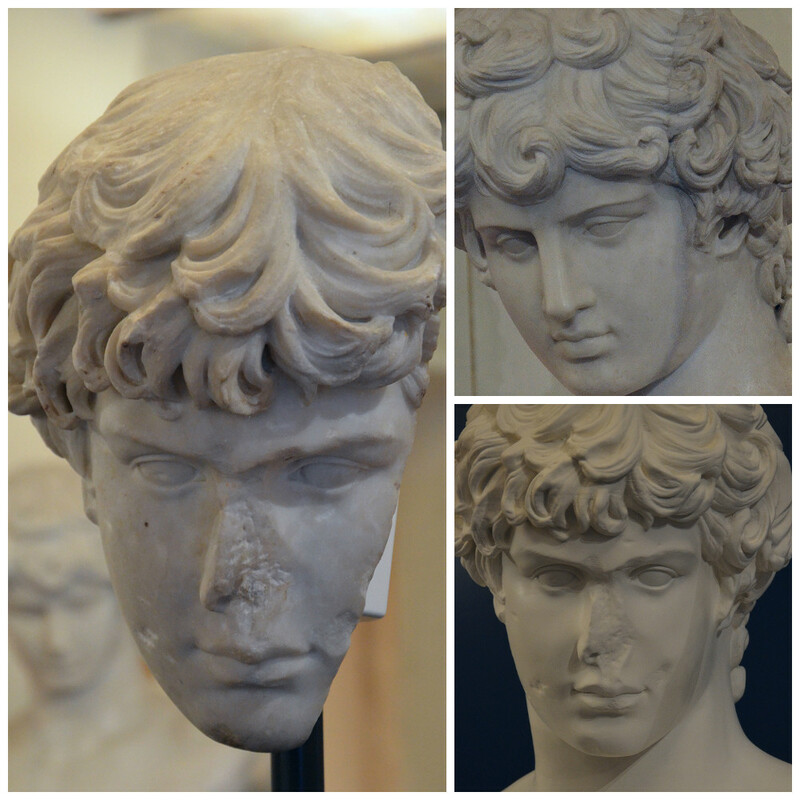 The two portraits in question are a bust in the collection of Palazzo Altemps in Rome (known as the Ludovisi Antinous) as well as a fragment of a marble head belonging to the Art Institute of Chicago. 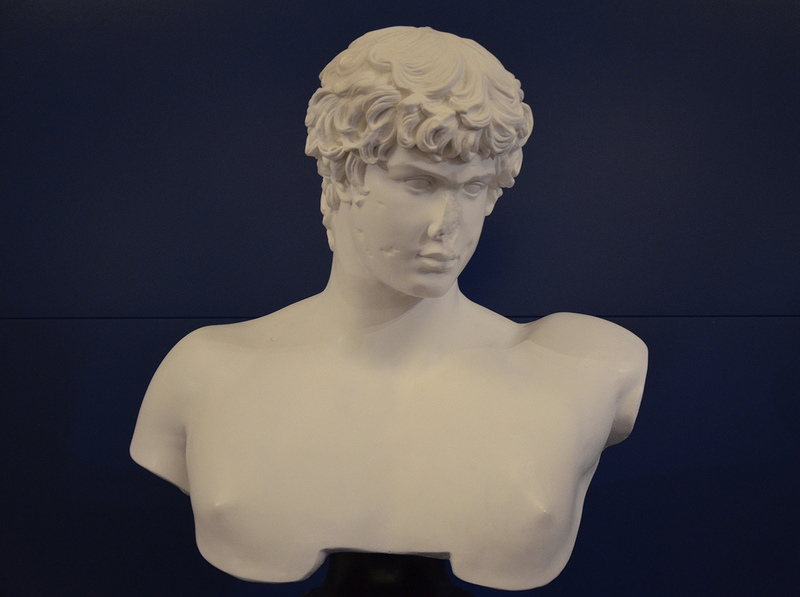 Marble bust of Antinous displayed in the Museo Nazionale Romano, Palazzo Altemps in Rome. 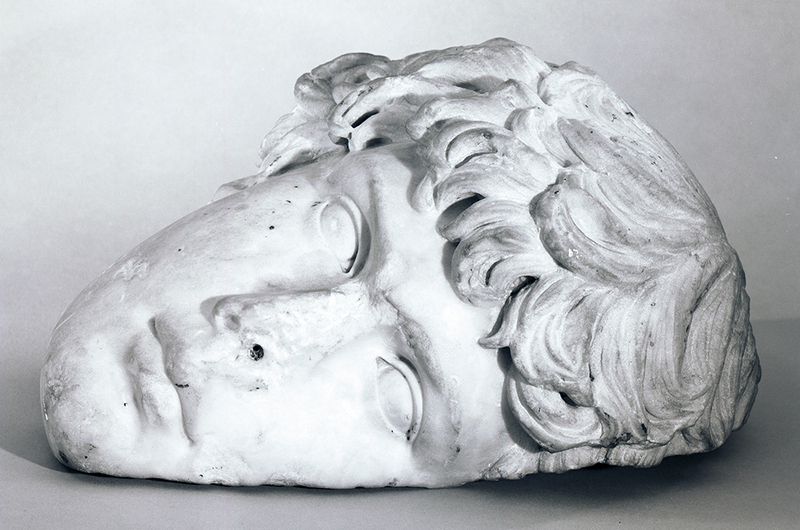 Fragment of a marble head of Antinous in the collection of the Art Institute of Chicago. The Art Institute’s fragment, comprising of most of Antinous’ face and his distinctive thick curly hair, entered the Art Institute of Chicago’s collection in 1922. While in Rome in April 1898, Charles L. Hutchinson, the Art Institute of Chicago’s first president, bought this fragment for his private collection to the artist and antiquarian Attilio Simonetti. It made its first appearance in 1913 in an article published in the Art in America magazine. The accompanying photograph depicted the youth’s head in right profile mounted as a high-relief on a marble plaque. Although presented as a relief, the Art Institute curator Frank B. Tarbell, insisted it was a fragment from a statue or bust which belonged to a group of Antinous portraits distinguished by a common hairstyle (later known as the Antinous lock-scheme). Nevertheless, the sculpture remained as a relief until restorations were conducted in the early 1960s. New photographs revealed the general condition of the ancient fragment and showed that it was broken following a diagonal line whilst its nose and neck were missing. 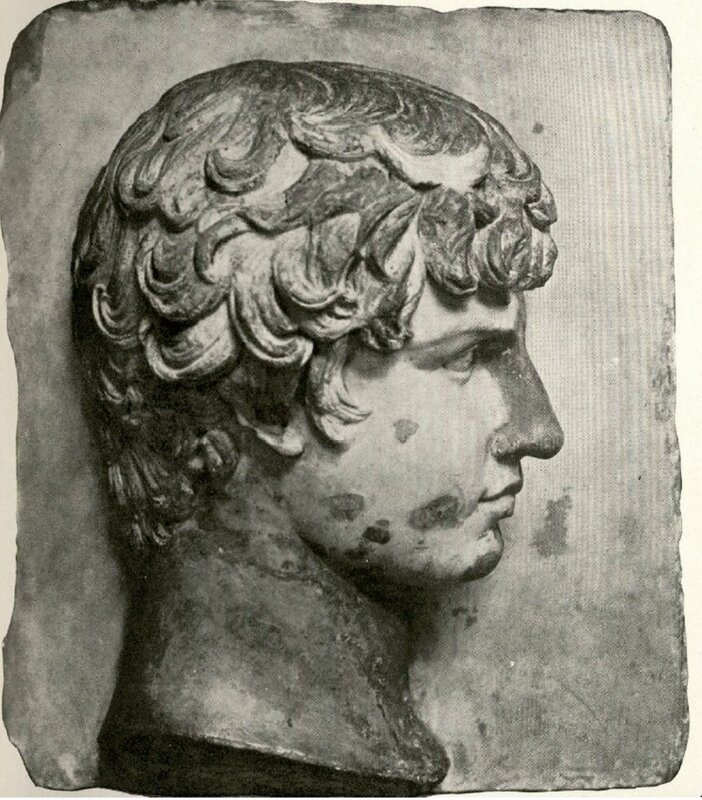 Photograph of Portrait Head of Antinous, early 1960s. Henry Geldzahler Papers, Yale University Collection of American Literature, Beinecke Rare Book and Manuscript Library. Simonetti’s claim that the Chicago head came from a relief was incorrect but his identification of the subject was right. The lock-scheme and facial iconography definitely belonged to one of the two main portrait types of Antinous. In 2005, on a trip to Rome, W. Raymond Johnson, an Egyptologist at the University of Chicago, suggested the theory that the Chicago’s fragment was originally part of the bust of Antinous that was housed at the Palazzo Altemps museum. 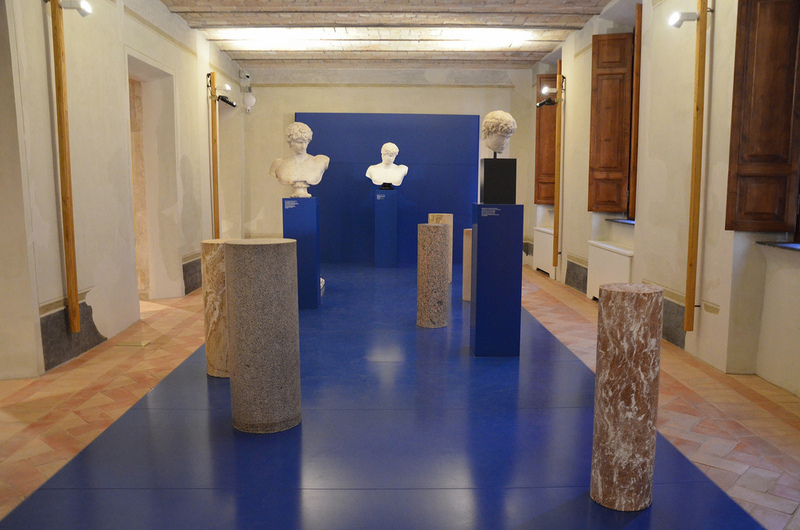 The marble bust once belonged to the Ludovisi family who assembled the most prestigious collection of ancient sculptures in Rome (today 104 sculptures from the Ludovisi collection are on display at the Palazzo Altemps). 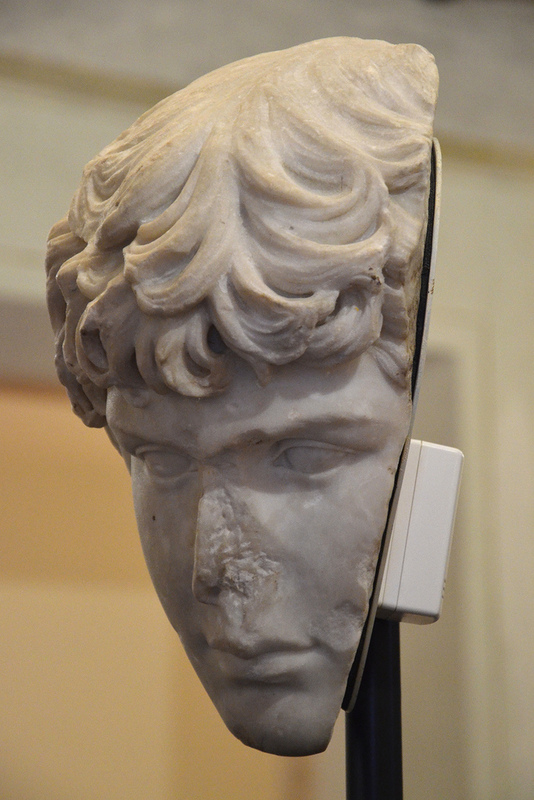 After the original ancient face of Antinous was broken at some unknown time (perhaps even before it entered the Ludovisi collection), the bust received a replacement face by the mid-18th century. Only the chest, neck and the back of the head were part of the original bust. The bust remained on display in the Villa until the late 19th century. 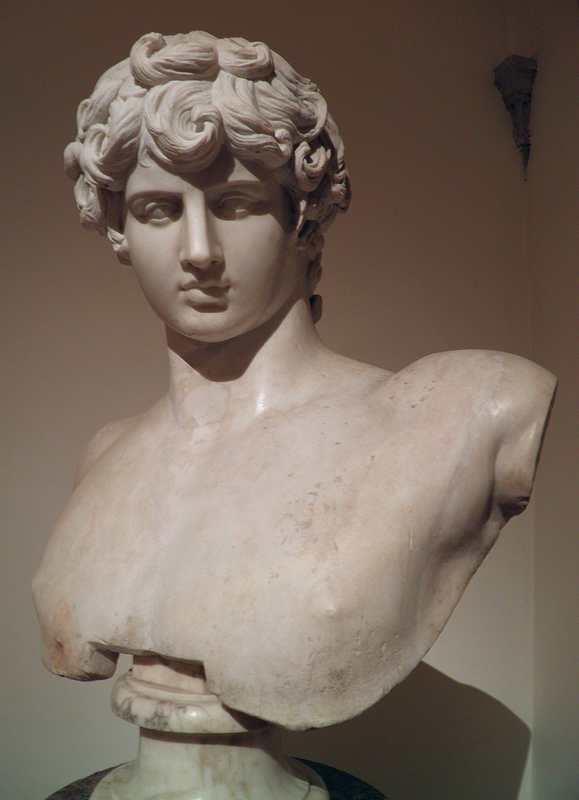 On 1901 the Italian State purchased the most important works from the Ludovisi collection, including the Antinous bust which has been on permanent display in the Museum of Palazzo Altemps since 1997. When Johnson saw the bust, he quickly realised that the face was modern and that the only original part was the back of the head and the shoulders. Then he noticed that both the Ludovisi bust and the Chicago head shared the same unusual diagonal break visible along the left side of the face. This led Johnson to believe that these two pieces originally belonged to a single sculpture. This hypothesis was confirmed after years of careful study which included three-dimensional measurements and the analysis of the marble in both pieces. In addition, a cast of the Chicago head was made for comparison with the Altemps bust. Placed side by side, the two pieces were remarkably similar in scale and general appearance. A short video outlines the steps scholars took to follow Johnson’s lead and ultimately reunite the two pieces. The exhibitions in Chicago and Rome were devoted to this fascinating discovery. Both shows were centered around the two marble sculptures portraying Antinous. 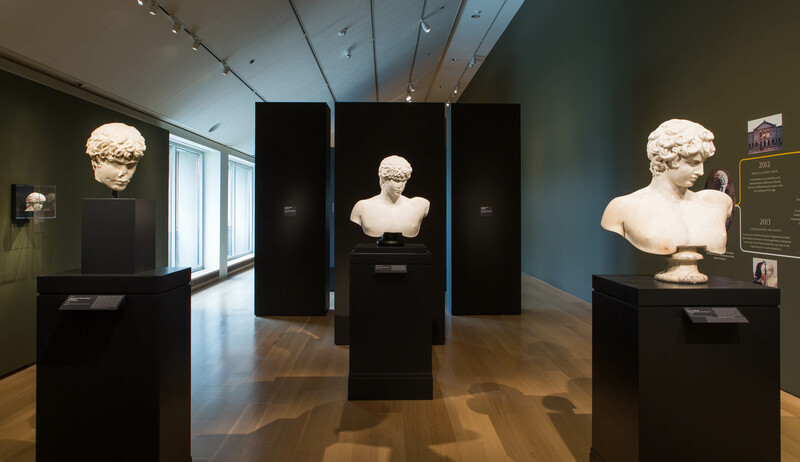 The Chicago fragment and the bust from the Palazzo Altemps were displayed together along with the full-scale plaster cast reconstruction that gave the impression of its original appearance in antiquity. Laser scanning and three-dimensional printing were used to produce a mold from which the plaster replica was created. 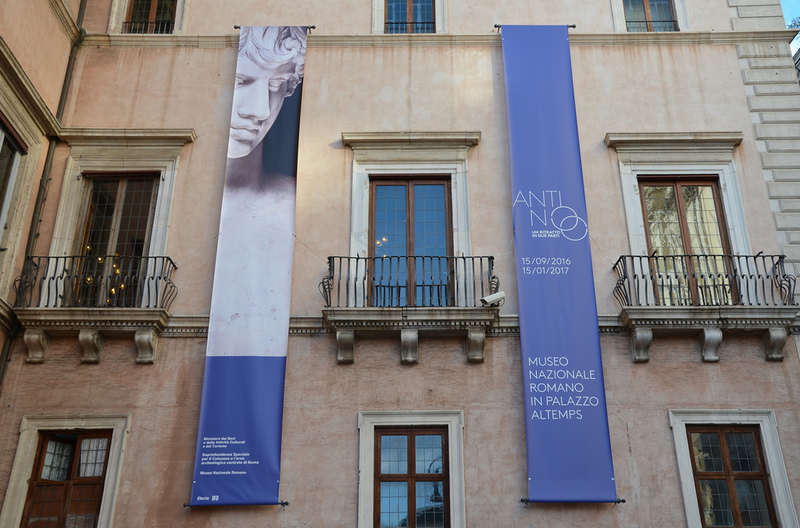 View of the Palazzo Altemps exhibition in Rome “Antinoo. Un ritratto in due parti”. The Chicago fragment (right), the Altemps bust (left), and a composite plaster cast of the two reunited (center). Cast in plaster re-creating the appearance of the original bust of Antinous. View of Chicago fragment of portrait head of Antinous at the Altemps exhibition. Among the pieces on display at the Art Institute in Chicago was also a bust depicting Antinous in the guise of the Egyptian god Osiris. The bust, from the Thomas Hope collection (1769-1831), is said to be from Hadrian’s Villa and was rediscovered in Thornbridge Hall, Derbyshire, in 2010. In addition, four bronze coins of Antinous, on loan from the American Numismatic Society, featured alongside the busts: a coin minted in Mantinea, another one from Ancyra, and two drachms from Alexandria. Bronze Drachm, Alexandreia, AD 134-135.
Credit image: the American Numismatic Society. Bronze Coin, Mantineia, AD 130. Bronze Coin, Ancyra, AD 138-161. Karen Manchester, “Cat. 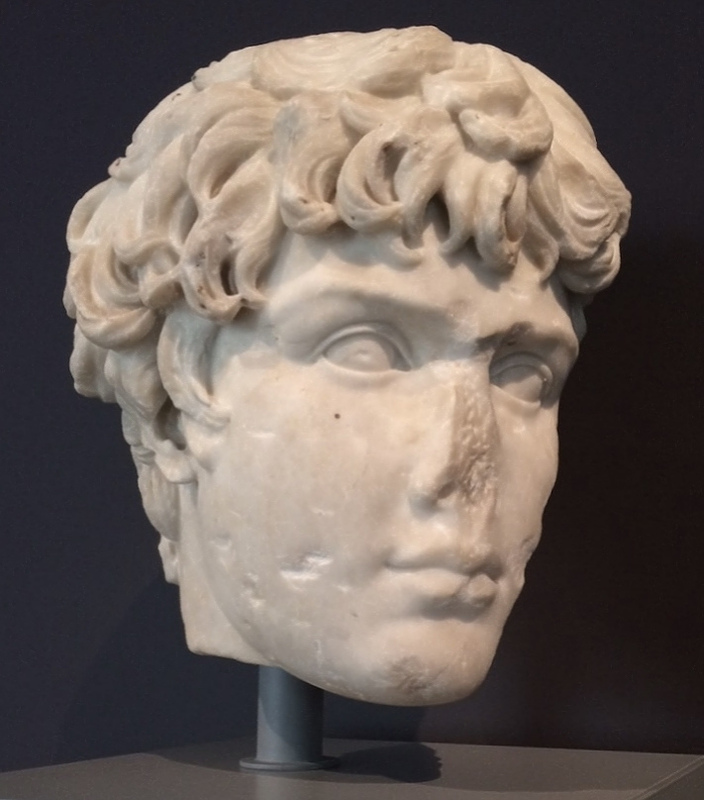 9 Fragment of a Portrait Head of Antinous: Curatorial Entry,” in Roman Art at the Art Institute of Chicago (Art Institute of Chicago, 2016), para 3. Egyptologist uncovers ancient puzzle by the University of Chicago. Thanks for sharing, I’ve been immersed in books about Hadrian recently, I”m currently reading Eromenos, a fictional novel told from Antinous’ point of view. Spectacular pictures of Antinous Carole. He was a handsome fellow whichever way you look at him.